Being persistent is one of my best skill traits, which has landed me internships, jobs and clients. I can say without a doubt that I wouldn’t be where I am today without being as persistent as I have been so far in my music career. Some of you are probably saying “that is great and all, but what do you mean being persistent has landed you jobs?” Simple, I can recall a couple of times that I have applied to places where I wanted to work, and I know one of the main reasons that I was offered the job in the first place was being so persistent in the interview process. I would send weekly check-ins to see if there were any updates, to see if they needed any new information for me, update the companies with any new projects that I completed and so on. The point being, people like to see that you are persistent about something that you want. It shows that not only do you care about the position that you are applying for but that you will bring that skill set over to their company if/when they decide to hire you. This is also true for artists. When you’re pitching for press outlets, it is always good to be persistent and follow up after the initial pitch. With how saturated the music business is now, people who check the submissions get hundreds of emails a day (trust me, I use to be in charge of DJBooth’s submissions back in 2012 and easily got 200+ a day… imagine today). If you don’t hear back within 2-3 days, simply send a message asking if the person got your email, and if they need any other information from you. Most of the time, they won’t get back to you due to their crazy email influx, but you will find the occasion blogger who loves artists who follow up even if they decide to pass on the music. It’s definitely a skill that takes time to perfect, and can be a bit awkward at first because you don’t want to come off as annoying. However, most of the time the reason the person forgets to respond to you in the first place is that something came up, and it simply slipped their mind. There have been numerous times where I have followed up with someone who meant to get right back to me, but just forgot. As you all know on a daily basis we are all bombarded with emails, texts, calls, etc. and sometimes forget to get back to everyone that we meant to. 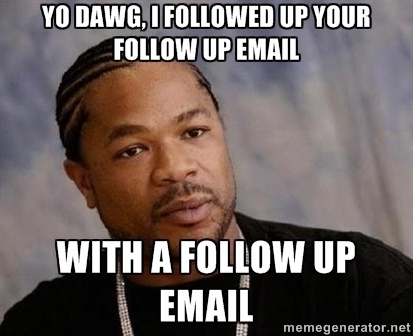 Now, every time after a conversation or email where I know I am waiting on some answer I make a note in my calendar to follow up with said person a week later. This reminder has helped me so much with following up with people and being on top of it. I highly recommend setting up this or something similar for anyone looking to be more persistent in the new year. Coming full circle, I really love it when I am working with someone and they show that same persistent skill to me. It not only shows me that they are more serious about the work, but it makes me want to go above and beyond in helping them succeed in this business because I can tell that they really are down to put the work in. Save Money In Your Sleep In 2017. Here's How. Previous Save Money In Your Sleep In 2017. Here's How.